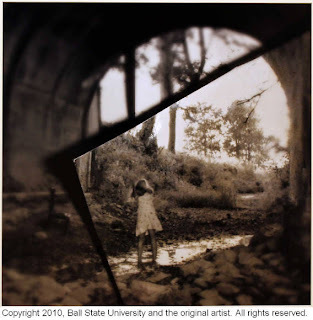 Visit the Digital Media Repository to view the latest Ball State University art students' theses projects from the 2010 fall semester. While displayed at the Atrium Art Gallery, University Libraries' staff photographed the pieces and made them available to a global audience in the Ball State University Student Art digital collection. Pictured below is a photograph titled "The In Between," part of the "I am Mine" series by Jessica D. Seib. Working in collaboration with Muncie Public Library, Ball State University Libraries' newest Digital Media Repository collection is the Thomas L. Ryan Diaries. This digital collection includes four volumes that account the life of early Muncie, Indiana resident Thomas L. Ryan dating from 1886 to 1890. Thomas L. Ryan was born in 1872 in Muncie, Indiana. After finishing his education in Muncie, Ryan completed a course in engineering at the Hoboken Institute of Technology and studied law under his father. He joined his father`s law firm, which became Ryan & Ryan, in 1898. He was also president of the Highlands Manufacturing Company of Muncie. Ryan wrote in his diaries every day. He recorded the weather, events at school, activities with friends, trips to the library and around town, chores and projects, and special events. This new area of the DMR consists of collections of historic photographs of Muncie and Delaware County from Ball State University Archives and Special Collections. The total number of collections will eventually grow to around 400 consisting potentially of upwards of 5,000 images. It is an eclectic group that will now be much more accessible to researchers. This is a great beginning that will contribute to the continuing growth and usefulness of the DMR. 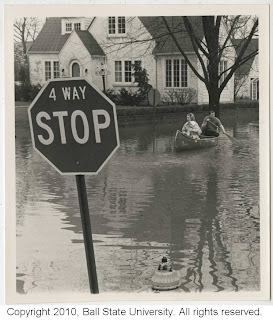 Pictured above is the 1964 flood in Muncie, Indiana. This digital collection contains 51 photographs taken by Raymond W. Trowbridge and Jessie Tarbox Beals in the 1920s and 1930s of fashionable suburban houses in northern Illinois and Wisconsin. 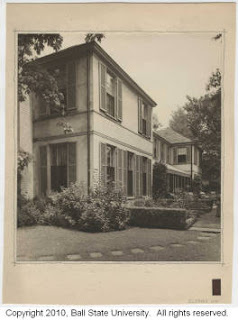 The houses were designed by architects Russell S. Walcott and Robert Work. Pictured below is a photograph of the Clifford Off house.